Exciting new science opportunities are in store during the perihelion passes (the point in an orbit when it is closest to the Sun) of the recently launched Parker Solar Probe (PSP). It will approach the Sun to within 10 solar radii (approximately 6 million km from the surface). For comparison, SOHO's LASCO C3's field-of-view extends to 30 solar radii (21 million km). The image below shows the PSP science windows when the spacecraft is within 38 million km (0.25 au) from the Sun. The perihelion passes in 2019-2020 and 2021-2022 are shown in red and yellow, respectively and the symbols are one hour apart. SOHO's LASCO observations will be critically important to assess the structures PSP will fly through during its close approaches to the Sun. 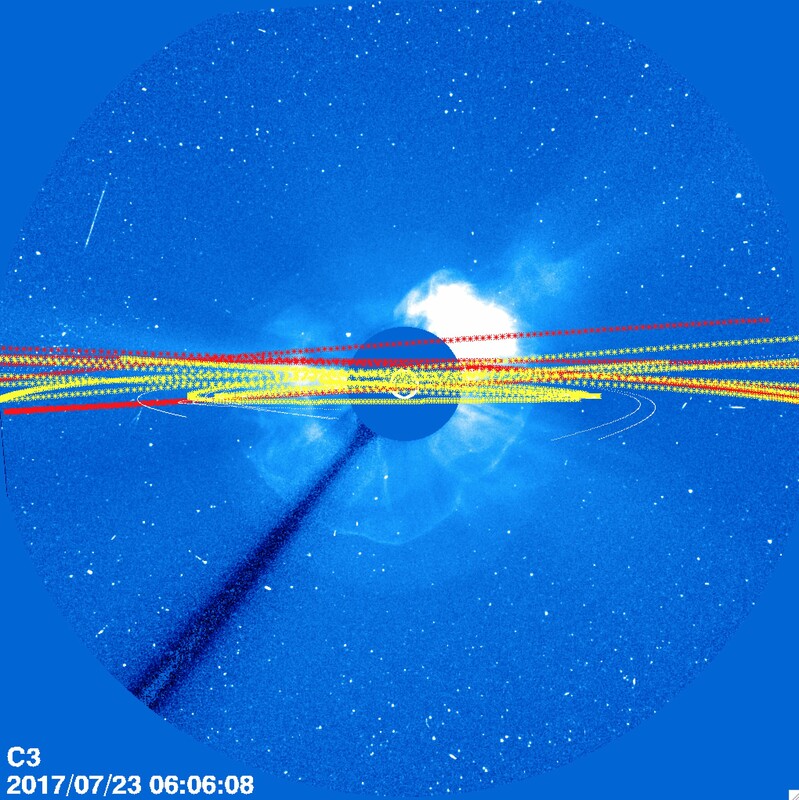 Thanks to the extremely well-understood performance of LASCO's C2 and C3 telescopes, LASCO will also provide a uniquely reliable way to cross-calibrate the photometry of PSP's heliospheric imager (WISPR). Joint observations between PSP and SOHO's payload will shed new light on how the Sun connects to Earth and the solar system and the heliosphere. With PSP measuring the nascent solar wind and the onsets and properties of solar particle events close to the Sun, SOHO will provide the near-Earth perspective and allow us to understand how solar wind streams expand and fill the heliosphere. 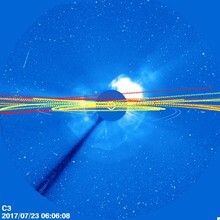 It will also provide a unique view about how solar energetic particles diffuse across the frozen-in interplanetary magnetic field -- a long-standing issue in heliophysics research. For the first time, scientists will be able to obtain long-awaited, concurrent, close to the Sun and near-Earth observations, which will also help set the stage for ESA's next solar and heliospheric physics mission, Solar Orbiter.